Haywood B. "Huddy" Hyman Jr. works with his sons, Thomas (center) and Haywood, at Hyman Bros. Automobiles used-car dealership on West Broad Street. A decision in late September 2009 by General Motors to shut down the Saturn brand threw Haywood B. "Huddy" Hyman Jr.'s life into turmoil. "We were pretty devastated," said Hyman, whose family has been selling cars in the Richmond area since the mid-1940s. Hyman, who had made a name for himself as one of the premier Saturn dealers in the United States, had been among the first in the nation to sell Saturn in 1990 when GM launched the brand. But GM's decision - and the recession - threw Hyman's auto business into chaos. Hyman was forced to close three successful Saturn dealerships - two in the Richmond area and one in Newport News. That meant losing sales as well as a loss of lucrative parts and service business. He pursued new car franchises to replace those dealerships, but nothing materialized in the Richmond area. In the two years since Saturn shut down, Hyman has reinvented his business by refocusing his attention on what started it all for his family in 1946: selling used cars. He has converted his two shuttered Saturn stores - on West Broad Street in Henrico County and Midlothian Turnpike in Chesterfield County - into used-car dealerships, operating them as Hyman Bros. Automobiles. He bought a Mazda franchise for the former Saturn store in Newport News. "It feels like we've been working around the clock for the last three years," Hyman said while sitting in the sales office of the Henrico store. "But we feel like we're headed in the right direction." He also brought his two sons - Haywood III and Thomas - into the business. Hyman, 59, still owns a Land Rover franchise that he has operated on Midlothian Turnpike in Chesterfield for years. But the big push these days is his used-car operations. 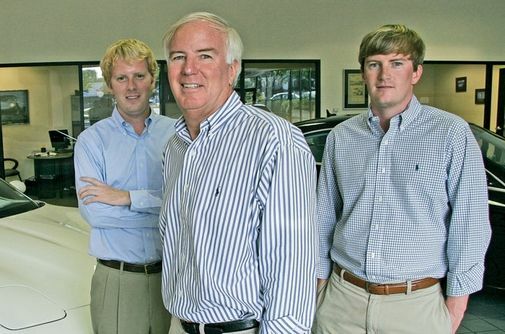 "The name Hyman Brothers has always been known in Richmond for quality cars," Hyman said. 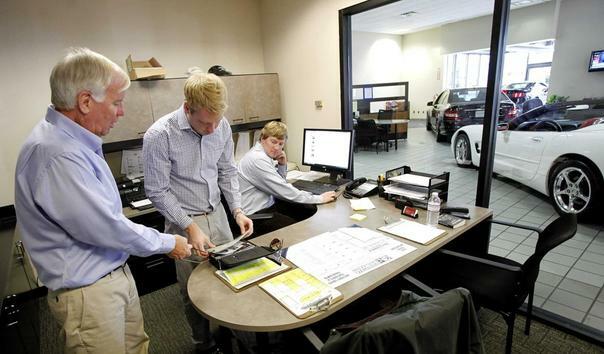 George Hoffer, an economics professor at the University of Richmond who specializes in the automobile industry and has followed the local auto business for decades, said he is not surprised by Hyman's turnaround. Hyman is "aggressive in a good way and quick to adapt," Hoffer said. Hyman's family began selling cars here in 1946. After returning from World War II, Hyman's father and uncle, North Carolina natives Edward and Haywood Sr., took $5,000 they had saved and started buying and selling cars. The first Hyman Bros. dealership was on Lombardy Street. They eventually moved the business to West Broad Street and, in 1955, paid $55,000 for a Pontiac dealership on North Boulevard. Edward died in 1994 and the elder Haywood died in March. Hyman began buying and selling cars as a teenager and eventually got into the family business with his brother Clarke. The two brothers bought their first car franchise in 1980 - a Buick store off West Broad Street in Henrico. The property for that Buick store sits behind the current Hyman Bros. lot and now is used to check in and start the reconditioning of the vehicles bought for the used-car operations. Over time, Hyman, who eventually bought out his younger brother, grew the business into a powerhouse. At its peak, he operated Haywood-Clarke Buick Pontiac GMC, the original store, as well as the two Saturn dealerships here and three Saturn locations in Hampton Roads. He also owned three Smart car dealerships in Paris. Hyman was the only American selling the Smart car, and he was one of Smart's largest dealers when the tiny car debuted in Europe in 1998. Hyman sold Haywood-Clarke Buick Pontiac GMC in 1999 to the owners of Dominion Chevrolet. He sold two of the three Hampton Roads stores to another dealer in 2004. A year after opening the Smart car dealerships, he sold them to the manufacturer because those stores were too time-consuming for him to operate from overseas. Hyman, one of the first Saturn dealers in the U.S., was at one time a major advocate for the vehicle and its unique fixed-price sales model, Hoffer said. In the early 1990s, GM, which owned Saturn, sent national and international media to Richmond to talk to Hyman, he said. "He was the face of Saturn dealers," Hoffer said. "He is clearly someone with national stature." The auto business for Hyman was rolling along fairly well until the recession put the brakes on his operations in the fall of 2008. "That's when it really started," Hyman said about beginning to downsize his operations. Hyman closed the West Broad Street Saturn store in November 2008. About 20 employees and 100 vehicles moved to the Saturn store on Midlothian Turnpike. "We wanted to consolidate everything under one roof," his eldest son, Haywood, said. But then the bad news came out in February 2009: GM, on the brink of bankruptcy, decided to phase out the Saturn brand. "It was a very difficult time," Hyman said. GM was able to stave off the closing of Saturn when billionaire Roger Penske of the Penske Automotive Group agreed in June 2009 to buy Saturn from the troubled manufacturer. But the reprieve was short-lived. By that September, the deal fell through and nearly 400 dealers had to close their stores. Haywood, who had just graduated from college and planned to follow his father's footsteps into the family business, recalls what he thought when he saw what was happening in late 2008 and early 2009. "I was like: 'Good God. What is going on?' "
He called GM's decision - and the day the final announcement was made - devastating. As the saga with Saturn unfolded, Hyman had the newly vacant West Broad Street property to worry about. With the economy as bad as it was, it was nearly impossible to sell the building and land. "You look back at that time and you just couldn't do anything," Hyman said. Later that year, he decided to start selling used cars on the property. The store reopened in March 2009 as Hyman Bros. The Midlothian location, which shut down when the sale of Saturn fell through, became a used-car lot by the end of 2009. There was talk of doing the same with the Newport News lot, but Hyman was able to buy a Mazda franchise for that location. "I find it interesting, and somewhat gratifying, that he's gone back to his roots," Hoffer said. Sales at the two Hyman Bros. Automobile stores average 125 to 150 vehicles per month. About 25 percent of those sales are conducted via the Internet. The Hymans expect unit sales in 2012 to be closer to 200 per month. Haywood said what's led to the revival is the way his family approaches the business. "We feel like we've got a good model," he said. While they credit the strategy for their recent success, Hyman said what he and his sons are doing is not that complicated. "It's the basics." The Hymans say the model has its roots in Saturn and the philosophy of the family's patriarchs. It comes down to taking care of customers by providing them with high-quality used cars at a decent price, they say. Which is not as easy as it sounds, they say. Each vehicle on the lot comes with a pre-set price that is non-negotiable. That removes the pricing pressure from the transaction and allows sales personnel to work with shoppers on finding the right vehicle. While the different way of selling is hard for some sales personnel who have spent their careers negotiating sales, eventually the system makes it easier and helps build a better relationship between buyer and seller, said Gardiner "GQ" Quaintance, sales manager at the West Broad store. "But it's not for everyone," said Quaintance, who has been in the automobile industry for more than 30 years. The key is to price vehicles competitively. That is especially important given that consumers can now go online and shop before ever stepping into a dealership. "If the price isn't right, people won't come in," Quaintance said. The more difficult part of the sales model is finding and selling the right vehicles. "It's a process," Haywood said. Hyman and his sons scour auto auctions and the Internet looking for vehicles as well as buying from the general public. They bought about $15 million worth of vehicles in the past 90 days. They currently have about 600 vehicles for sale. Every vehicle that goes on either of the lots goes through a rigorous reconditioning process that includes touching up dings, if needed, and mechanical work. One detail that Hyman said is particularly important is to make sure each vehicle has factory floor mats and the owner's manuals. It's that attention to detail that makes a big difference to buyers, Hyman said. That's especially true these days, when there is so much more at stake as they work to rebuild. "You have to be on top of everything," Haywood said. Thomas (left) and Haywood (right) are the third generation of Hyman brothers. 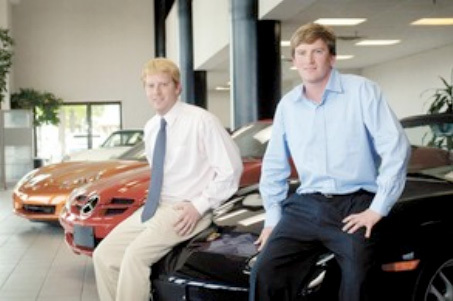 Meet the brothers, Haywood and Thomas, now the owners/operators of Hyman Brothers Automotive. The franchise was founded by their grandfather (Hyman Brothers Pontiac, originally at 4300 W. Broad St.) and continued by their father and uncle. Today, Haywood operates the Broad Street franchise, and Thomas operates the Midlothian Turnpike franchise. The Hyman family also owns and operates Land Rover Richmond and Hyman Bros. Mazda of Newport News. The Richmond Drives crew caught up with them in Midlothian to hear more about their history and operation. Q: Since y'all are third generation in the car business, let's start with how you got here. Were you car guys when you were younger? Thomas: We always liked to buy and sell them. We've been messing around with cars since we were teenagers, buying and selling them at auction, wholesaling, doing a bit of everything. When we were 12 or 13, we started detailing cars. We've had every odd job around the dealership since then, and we were always interested in the actual car business. We'd pretty much buy anything and resell it. Haywood: Our stores are run the same way now as when we got started. We'll buy anything off the street, whether it's a $50 car or a $100,000 car. Thomas: I bought a Ferrari off the street, so we'll buy anything. Haywood: But our inventory appeals to anyone. We've got cars starting around $4,000 or $5,000 to high-dollar [prices] upwards of $50,000. The average car here is probably around $25,000. We had a good coach and teacher in our dad. He told us, "If you have a nice car, you don't ever need to panic. If it's priced right, it will always sell. A really nice car will sell itself." Q: Maybe y'all could talk a bit about your business then. What's your business model? Haywood: Our main model is low-mileage cars. We buy nice, original, clean cars, and we'll pay a little bit more for a nicer car. We definitely have a reputation for having cars you can't just go to any lot and find. Thomas: We know the market fairly well. The two of us do most of the buying, so we know what to pay and what to sell for. But like Haywood said a moment ago, we'll buy any car off the street. One thing we just started recently ? we'll beat any CarMax appraisals. We'll beat any of their offers. Haywood: We'll sell the cars at auction if they don't make it through our inspection process because we want to sell nice cars at the dealership. Thomas: A big part of our business is out of state. We advertise online, and our website is really interactive. We get calls from all over the country. Since it's hard to buy a car sight-unseen, our websites have 25+ pictures for each car. Haywood: To sell like that, though, the cars have to have low miles, and they also have to be priced right. We do no-haggle pricing, which is easier and takes the stress out of the entire process. Q: Can you elaborate on the no-haggle pricing? Thomas: Our dad opened a Saturn dealership in '91, and Saturn's philosophy was one-set pricing. Our dad liked the process so much and it's worked for us. We run a low-pressure sales environment and cater to customers' needs. We try to make things quick and easy, so we just have one price. Haywood: But that means you've got to stick to the price 100 percent, which means pricing right the first time and sticking to it. We spend a lot of time making sure our cars are a good value. We get every ding out, every scratch. We put a lot of effort and energy into getting the cars in the right condition. Thomas: No blemish goes unseen. That's what our dad has ingrained in us. If you're shopping for a car in Richmond, you'll find nice cars for a nice value if you come to us. Haywood: Nice cars in a low-pressure environment. Quick and easy. Also, we service all makes and models and every vehicle we sell. Huddy Hyman, flanked by sons Thomas, left and Haywood: "We're having fun. I feel like I'm 16 again." Huddy Hyman, along with most other Saturn dealers, was devastated when General Motors Co. pulled the plug on his business last year. But Hyman's story has an upside. A year after the brand's collapse, as he prepares to take down the last sign on what were once three thriving Saturn stores in the Richmond, Va., area, Hyman says he is having a blast rebuilding his original brand: the Hyman family. "It was an emotional thing to have them kill Saturn like that," says Hyman, a 58-year-old second-generation dealer. "But I feel pretty good about it now. We're having fun. I feel like I'm 16 again." At 16, Hyman and his brother were scouring the garages and for-sale listings of Richmond after school. They bought used vehicles, worked on them and resold them at a profit. They operated independently of their father and uncle's Pontiac dealership but traded on the family's reputation in town for being honest and reliable. Now Hyman has gone back to the family's original 1940s business name -- Hyman Bros. -- and brought another set of brothers into the shop with him: his sons, Haywood, 26, and Thomas, 24. Together, the father and sons are building a national used-car sales company, run separately from Hyman's Land Rover new-vehicle franchise. The business is relying heavily on Internet communications and sales transactions and is focusing on late-model, low-mileage vehicles above $20,000. The father is teaching the sons the ropes of hands-on retailing, customer interaction and fixed operations. The sons are teaching the father a few things about Internet commerce, 21st century response time and the buying preferences of young consumers. The elder Hyman describes his role as "coordinator." He has moved his office down to the garage where vehicles are unloaded from trucks to begin reconditioning. He inspects the cars and the work being done to them. "I just want everything to be done properly," he says, "just to keep everything moving in the right direction." So far, so good. Hyman Bros. has been selling about 140 cars a month at an average price of $23,000, he says. A fourth of the sales are coming from out-of-state buyers the venture reaches online. "We've gone to all Internet advertising," Hyman says. "That's where everything is going. We're doing things differently but still operating with the philosophy we've always had." That philosophy of fairness goes back a long time. Hyman Bros. was started by two servicemen coming home from Europe after World War II. The young men had been sending their Army pay home to their mother diligently every month. Their return to the States found them rich in 1945 currency, with $2,500 -- enough to open a used-car business the next year. A Pontiac franchise came along in 1955. In 1980, while Huddy was still in his 20s, the Hymans added a Buick franchise. Porsche and Audi franchises came along after that. Others followed through the 1990s. In the late 1980s, Hyman met the franchise development team from Saturn. Saturn was targeting GM dealers and others who boasted the industry's highest customer satisfaction scores. The Hymans qualified. And Huddy Hyman was looking for a new concept in auto retailing that broke with the industry's old habits. "I never liked negotiating for car prices," Hyman says 20 years later, referring to Saturn's then-controversial philosophy of no-haggle selling. "I don't think customers like negotiating. They just want a fair, honest price. "I don't know how anybody runs a dealership any other way. Your communications break down. You forget what you've told your employees. Your people forget what they've told customers. Customers get angry. You have to go one-price. Saturn was right about that." Hyman's new used-car trade still embraces the approach. Before his time: Father, uncle opened used-car store in Richmond, Va. In the early 1990s, as Saturn took off nationally, Hyman became an enthusiastic advocate of its relaxed and open shopper-friendly business model. He extolled Saturn's virtues in a newspaper article, attracting the attention of executives at Daimler-Benz AG in Germany. Daimler-Benz was quietly planning to introduce a global small-car brand called Smart. Hyman's comments on Saturn prompted the German automaker to track him down in Virginia and invite him to help them articulate the retail model for Smart. Hyman agreed to fly over and help the Europeans as a courtesy, sharing what he believed and what he said Saturn represented. In return, as the brand came to market a few years later, Smart awarded Hyman the plum franchise for all of suburban Paris. In 1998 he opened a ring of Smart stores around Paris and hired a local staff. In his best high school French, he trained them in his approach to gentle, no-hassle customer relations. He flew back and forth from Virginia regularly to oversee the operations but sold the venture in 1999. In the years that followed, Hyman sold off most of his franchises to focus on the Saturn brand. It proved to be a miscalculation. Throughout the past decade, as U.S. buyers shifted to big SUVs and crossovers, GM proved incapable of repositioning small-car Saturn in the market. As a new era of fuel consciousness arose in 2008 and 2009, Saturn largely had abandoned its roots as a small-car alternative to imports. By the end of the decade, even as the brand rolled out sharp new models, Saturn had been designated as a problem brand for financially struggling GM. Through the summer of 2009, Hyman and hundreds of other Saturn dealers waited nervously as billionaire megadealer Roger Penske considered whether to buy Saturn from GM. That plan collapsed in September 2009. Dealers were given until November 2010 to close their stores. "Life goes on," Hyman says, as Haywood hands him a sales contract to sign. A consumer in Wichita, Kan., has purchased a Hyman vehicle, unseen and undriven, based on the dealership's word that there is no sign of cigarette smoke in the car. And Hyman has paid $26,000 to another customer in Texas for a Lincoln Navigator, sight unseen. "A lot of this comes down to communicating with people on the phone," he says. "That's where you have to be most attentive. I don't want any customer to be surprised or disappointed. "In talking to people on the phone, you can usually get a good picture of what you need to know. And on our end, we have to be completely honest with people and provide very thorough information. Our reputation is at stake." Haywood recalls the conversation with his father that started the third-generation business. He and his brother had been doing exactly what Huddy and his own brother had done as young men in the 1960s -- buying and selling independently. But when the Saturn brand imploded, Huddy approached his sons with a question. "He asked me, 'What do you want to accomplish? Do you want to open a retail store?'" Haywood and Thomas assumed their father was proposing a store that would sell used vehicles retailing for $5,000 to $10,000 and an inventory of 20 or so cars on the lot. That was hardly the father's vision. "We didn't realize how powerful this could be," Haywood adds. "We learned that there's a market for $30,000 and $50,000 cars when you do things right. And right now, we've got about 500 vehicles on the lot. We've realized that there is a lot of potential." Huddy says rebuilding Hyman Bros. with his sons is rewarding, but they remain open to opportunities for new-vehicle franchises. The high prices and scarcity in the used-vehicle market that dealers have been coping with this summer are challenging, he admits, but merely temporary. "I've seen the market change like this before, and it will return to where it used to be," he says. "For us, the most important thing in all this now is communicating clearly with our customers and doing things right," Huddy says. "We're keeping a close eye on everything. I guess I've always been a hands-on dealer, but never to the degree I am now -- which is fun." The story about Huddy Hyman is one for the ages ("Saturn collapse sends veteran back to his roots," Oct. 11). It represents not only the adventuresome and dynamic nature of the family-owned car store but also the dynamics of a family that has been serving car buyers in Virginia for decades because of personal integrity and an honest approach with customers. That family personifies the characteristics that lead to success. I grew up in Richmond, Va., as a lucky friend of the Hyman family. One of the original brothers, Ed Hyman, hung the moon as far as I was concerned. In 1967-70, most dads would not speak to a young high school boy when he came over to visit and hang out. He made everyone feel important, even a high school kid. That -- and the honesty that his business was known for -- made a lasting impression on me and gave me a high regard for car dealers, especially at family-owned stores. Years later, I was offered the opportunity to run the Florida Automobile Dealers Association. It was my love for the Hyman story, the legacy of that special Dad, and the wonderful reputation of the Hyman brothers that led me to enter this wonderful business. After almost 10 years in Florida representing the state's franchised new-car dealers, I am thankful the story lives on with great men like Huddy Hyman. Some dealers touch lives beyond their customers every day, and I am humbled and honored to work for them.